To counter the myths and misunderstandings surrounding energy, the Institute for Energy Research produced Hard Facts, an energy primer that offers an in-depth explanation of domestically produced fossil fuel and renewable energy sources. For example, readers will learn that petroleum provides more than 35 percent of US total energy and that global proven oil reserves doubled in the last thirty years thanks to improvements in oil exploration and production technologies. Hard Facts will educate the layman, the news reporter, and the policymaker about domestic energy resources. 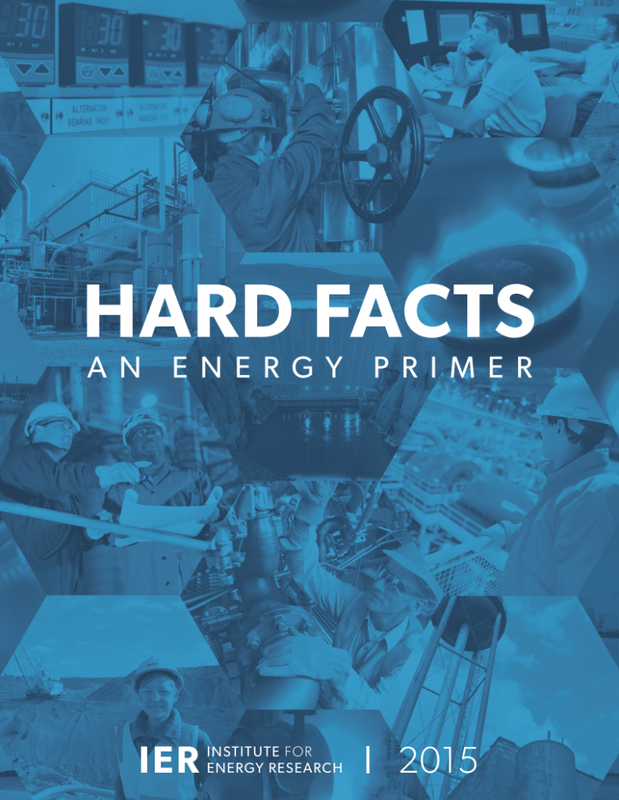 Hard Facts provides a foundation from which an honest and meaningful conversation can take place on our energy future. Affordable, reliable energy is essential to the economy because energy powers everything that makes modern life possible. It heats our homes, lights the night, fuels our transportation, and powers our machines. Put simply, energy makes our lives better. Affordable energy makes the economy more efficient, lowers the cost of goods, and saves Americans money. More importantly, affordable energy allows us to spend more time with our families and friends and less time merely working to survive. Moreover, by making transportation less costly, affordable energy gives us greater freedom to live, work, and play how and where we want. Affordable and abundant energy is a crucial component of a strong economy. Low domestic energy prices help keep jobs at home by lowering the cost of producing goods and services in the United States. There are, however, a number of challenges to maintaining a sufficient supply of affordable energy. Seemingly every year there is a new energy bill in Congress that alleges to fix our energy problems. The premise of these bills is often fatally flawed resulting in the cry for a new national energy policy practically every year. Energy policy would be greatly improved if policymakers took into account the actual energy landscape. Far too often, energy bills are based on incorrect assumptions, such as the notion that new, revolutionary technologies, such as affordable cellulosic ethanol, are just around the corner if only the federal government provides the energy industry sufficient mandates and subsidies. Time after time, experience has shown that the government cannot force new technologies to market. Policymakers should take time to understand the facts about energy and the obstacles to making it affordable and reliable given its critical role in our lives and our economy. America is home to vast natural resources, but many of our energy policies are built on the notion that energy is scarce and becoming more scarce. The reality is that we have more combined oil, coal, and natural gas resources than any other country on the planet. We have enough energy resources to provide reliable and affordable energy for decades, even centuries to come. The only real question is whether we will have access to our abundant energy resources, not whether sufficient resources exist. To read the second edition of Hard Facts, click here. To read the first edition of Hard Facts, click here.